Leather Notebook is exclusively made for such people who loves writing their memories and like making notes. Our Leather Notebooks and Paper Journals are made as per your specification so that it is unique to you and your style. Handmade Leather Notebooks are one of the few items carried around by your staff or customers therefore it becomes necessary they look apart just like our Leather Notebooks. Similarly our Paper Notebooks and Journals will carry your messages and complement your company or event. Leather Notebook is made from original Genuine Leather and has Recycled Paper inside. Recycled Paper Notebook comes in many sizes and can be customized according to buyer need. Innovative Paper Store offers the widest choice of Handmade Paper cover materials and colours. 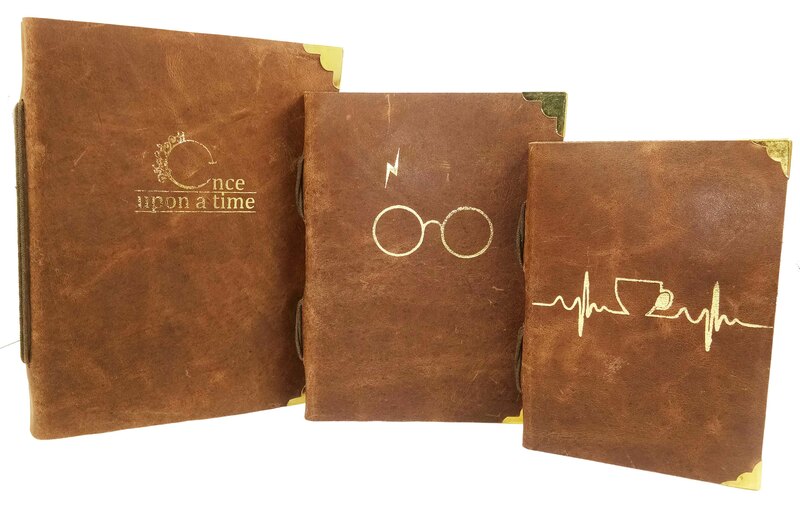 This makes the Paper Notebook look and feel different and sets it apart from the other Leather Notebooks, Leather Journals & Travelers Journals available by other suppliers. This notebook is not only made from Recycled Materials but also completely Handmade Notebook. It is most commonly called as Handmade Leather Journal. We use the best quality materials like Recycled Paper, Handmade Board and Acid Free Paper. This is why our branding is the highest standard so the Leather Notebook becomes a wonderful present and gives impressive looks for the one who is holding our Handmade Leather Notebook. Our Leather Notebooks and Leather Journals are completely Fair Trade and Sedex Certified Products. Leather Notebooks can be ordered in various sizes and color with assorted Embossed designs on it. Embossed Leather Journal Recycled Paper Products. We use the best quality materials like Recycled Paper, Handmade Board and Acid Free Paper. This is why our branding is the highest standard so the Leather Notebook becomes a wonderful present and gives impressive looks for the one who is holding our Handmade Leather Notebook. We are producing all kinds of Handmade Paper Products which are Eco Friendly products and Tree Free Paper. We are making Paper Bags, Boxes, Notebooks, Journal, Paper Hanging Decorations, Paper Stars and many more. Our design and production team is capable of giving embossing or debossing effect with your company logo or the entire cover. Our Leather Notebook may also have molded metal shapes helping in gracing the product. Our Paper Notebooks and Travels Journal can also have metal closures or contrast stitching around the edges which is extensively followed by our company only.